How can we make Valentine's Day more "heart healthy"? With Valentine’s Day right around the corner, we will all be tempted to indulge in the chocolate and candy that float around this time of year. Being its American Heart Month, this is a great opportunity to teach ourselves and our children how to make a positive association with healthy choices and a healthy heart. What a better day than on Valentine’s Day itself! How did Chocolate become such a part of Valentine’s Day? Casanova ate chocolate to make him virile. Physicians of the 1800s commonly advised their patients to eat chocolate to calm their pain of a lost love. Richard Cadbury produced the first box of chocolates for Valentine’s Day in the late 1800s. At this time more than 35 million heart-shaped boxes of chocolate will be sold, over $1 billion worth of chocolate! To learn more fun Valentine’s Day facts, please see the below link. Instead of sending candy to your child’s school or daycare, consider mini boxes of raisins or pretzels, even fruit that’s decorated or pencils and stickers. Instead of gifting the typical box of Chocolates, create your own dark chocolate fondue and dip a variety of your favorite fruits to give somebody or enjoy with your family. For those of you that still want to have some sweets, combining those cravings with something healthy will add a little nutrition to your day. Try this fruity nacho recipe; you can even do it in the shape of a heart; http://www.bortonfruit.com/fruit/recipe.html?recipeid=108. 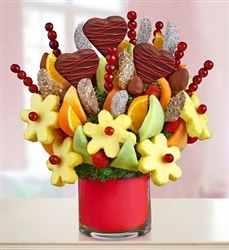 Or enjoy these Valentine Fruit Kabobs with Cupid’s Fruit Dip; http://www.bortonfruit.com/fruit/recipe.html?recipeid=111. And of course you can’t forget the classic Valentine Caramel Dipped Apples; http://www.bortonfruit.com/fruit/recipe.html?recipeid=106. For those of us who seem to always be looking for an excuse to eat sweets, here are a few recipe’s on the “healthier” side that would still be considered a dessert; Healthy Apple Cake VDAY Recipe; http://www.bortonfruit.com/fruit/recipe.html?recipeid=109, or these Chocolate Apple Cupcakes with Almond Butter; http://www.bortonfruit.com/fruit/recipe.html?recipeid=110... Yum! 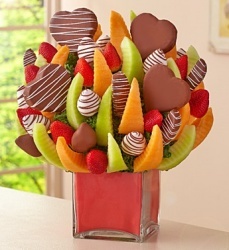 Another idea, create a bouquet out of your favorite fruits. Choose to dip a few of them in chocolate, caramel, or whatever you desire. This can be a really creative way to share some dessert with your loved ones, see a few examples below! 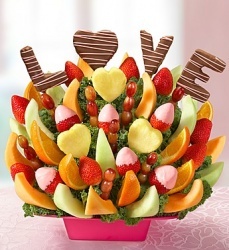 From all here at Borton Fruit, we hope that everybody enjoys their Valentine’s Day! Be strong enough to escape some of the temptations and get creative incorporating fruits to make your day more “Heart Healthy”.